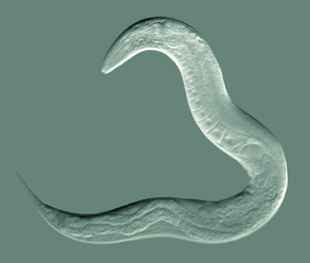 WIKIMEDIA, BOB GOLDSTEINEarly-life exposure to pathogenic bacteria can induce a lifelong imprinted olfactory memory in C. elegans through two distinct neural circuits, according to a study published today (February 11) in Cell. 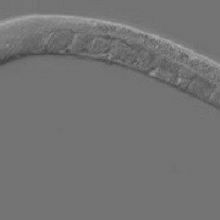 Researchers from Rockefeller University in New York City have shown that early-life pathogen exposure leads the nematode to have a lifelong aversion to the specific associated bacterial odors, whereas later-in-life exposure spurs only transient aversion. A classic example of imprinting is how geese form attachments to the first moving object they see after birth; Nobel laureate Konrad Lorenz famously showed that the “moving object” could be himself instead of a mother goose. During the critical period at the start of life, animals often have unusual abilities to create and maintain long-term memories. 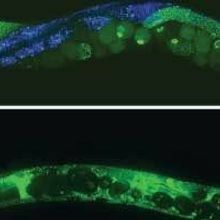 For the present study, Rockefeller’s Xin Jin and colleagues described a form of aversive imprinting in their C. elegans: newly hatched nematodes exposed to Pseudomonas aeruginosa PA14 or toxin-emitting Escherichia coli BL21 established a long-term olfactory aversion to it. Animals that experienced the pathogen immediately after hatching were able to synthesize and maintain the aversive memory for the whole of their four-day lifespans, while animals trained in adulthood only retained the aversive memory for up to 24 hours. 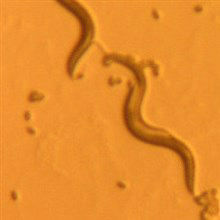 C. elegans has an exceedingly compact nervous system with only 302 neurons (compared with 250,000 in the fruit fly Drosophila and 86 billion in humans). To understand which specific neurons were involved in the different stages of aversive imprinting, the researchers selectively and reversibly deactivated individual brain cells. Silencing the neurons AIB or RIM during the memory-formation phase prevented learning in the newly hatched nematodes, but silencing these same cells during memory retrieval showed no effect. The opposite was true of the neurons AIY and RIA: these cells could be silenced during memory formation with no effect, but were indispensable during memory retrieval. The principle of separate neural circuits for memory formation and retrieval is far from unique to C. elegans. 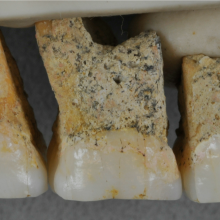 It was shown in humans through cases such as the famous patient “H.M.” who, following surgery that removed his medial temporal lobe, was able to retrieve old declarative memories but unable to form new ones. Of course, memory formation and retrieval circuits must communicate with each other for learning to occur. The researchers found one molecular bridge between the circuits in the neurotransmitter tyramine, a homologue of adrenaline in mammals. Tyramine was released by the memory-formation neuron RIM and detected by the memory-retrieval neuron AIY; the neurotransmitter alone could replace the requirement for RIM activity in the C. elegans learning process. “We often describe phenomenology and then speculate about the underlying machinery, but research in C. elegans—and especially this particular group—have really taken it to a different level, describing behaviors in great mechanistic detail,” said Harvard neurobiologist Bence Ölveczky, who was not involved in the research. X. Jin et al., “Distinct circuits for the formation and retrieval of an imprinted olfactory memory,” Cell, doi:10.1016/j.cell.2016.01.007, 2016.